Most of the people in the picture are part of the Vernon clan. All were named on the back of this photograph. Who I am not sure about is the older couple center front. The man was labeled "Pa Paine" and the woman "Aunt Jane". If "Pa Paine" is Samuel Paine that married Mary Hickman (parents James Hickman and Elizabeth Brown) he would have been 61 years old in this picture which seems possible to me. Any other ideas? Rebecca Vernon (dau. of Jeremiah Vernon and Betsy Stark) married Richard Starling and they had a daughter Jane but this Jane would not have been my great grandmother May Vernon Hickman's aunt. (May labeled this picture). Another thought was the wife of Isaac Vernon, Martha Jane White (1860-1947). But if this picture was taken in 1916 as indicated she would have been 56 years old and the woman in the picture seems older to me. Can anyone help me identify these two people? Does anyone else have this picture? 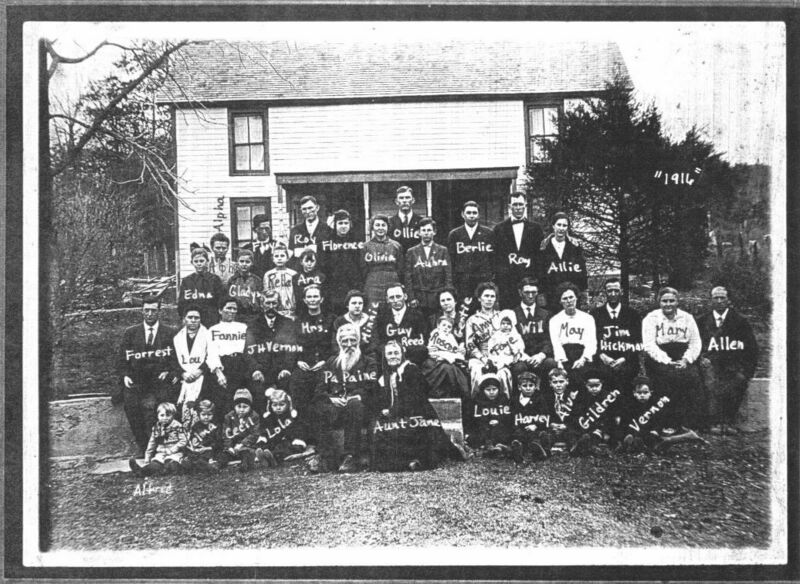 The picture was taken in Eldon in front of James Harvey Vernon's first "real" (not log) home. Please be patient - this picture is 202k,and may take a while to download.